At Refined Rustic Furniture we build unique one-of-a-kind walnut furniture for a large variety of clients. Our Walnut Collection grows with every order. We do Custom furniture so most of our collection is only available to view on our website and social media pages. See our Facebook page to join the crowd. We’ve built walnut furniture over and over again. Here are some examples of the different creations we’ve made. Slabs, Live-Edge & Dimensionally stable lumber. Walnut is a top pick for any home. 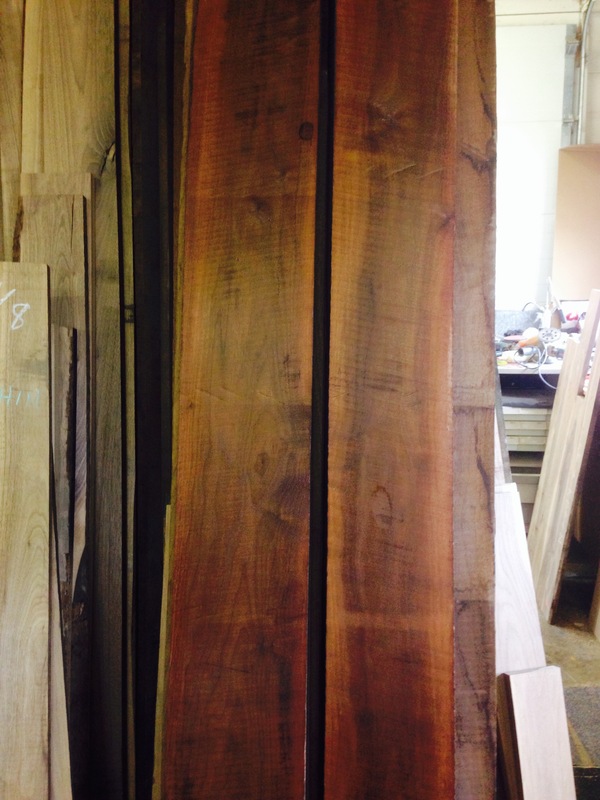 Black Walnut, Roasted Walnut or Claro Walnut Slabs. We have been using walnut for many years. It’s a strong wood and is ideal for a great variety of designs. Beginner or expert, Walnut is a warm and decorative figured material. In this blog we are showcasing a few of the projects we’ve done for our clients. When seeing some of these pieces it’s easy to understand why it’s such a sought after material for woodworking. There are many different types of walnut that come from many places. Because we are located in Calgary, Alberta we tend to import from California, and Eastern Canada and U S.
This Claro Walnut slab was turned into two End-Tables. The rustic edge look with the points in the bark are smooth and therapeutic to run your hand along. 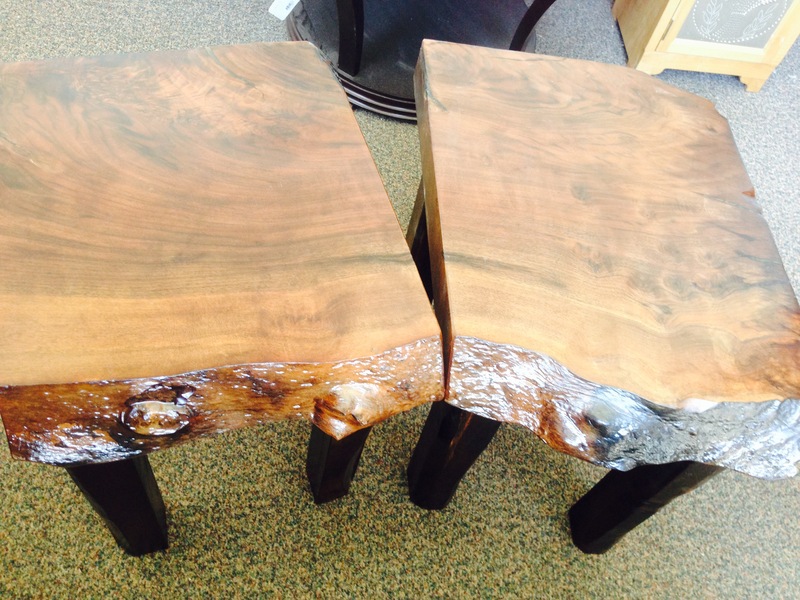 Matching slab end-tables are great for living room or bedroom. Slabs: Measuring as wide as 35″ and 10′ Long. 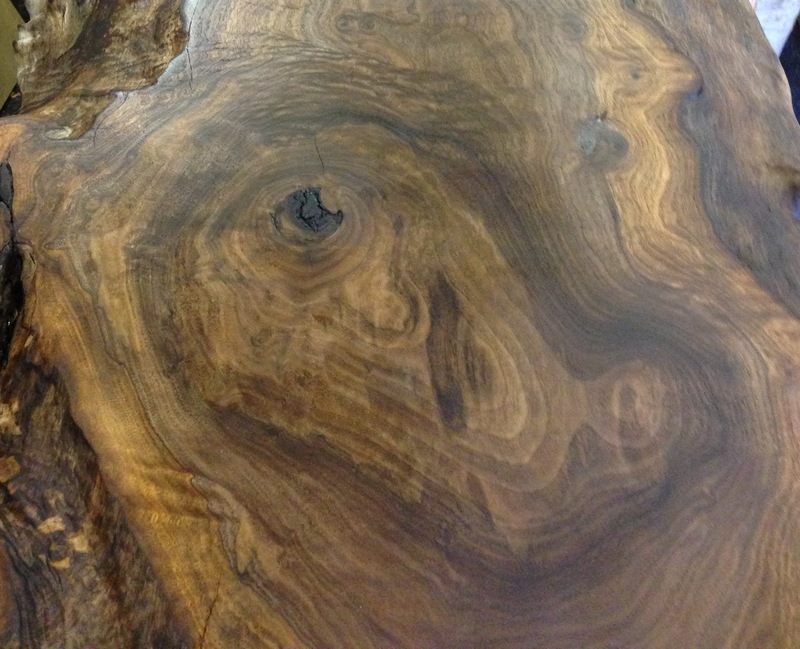 Walnut slabs have Live, Natural edges and colours. This is perfect for tables and desks. Kitchen counters and Bar tops are a popular choice as well. Dimensional Walnut: Straight cut and cured for easy finishing. Dimensional lumber joined together to make any surface as wide as necessary and 12′ Long. This makes it perfect for board room table and the other larger generational projects. 1″ and 2″ thick pieces are available, while slabs come in 3″. Walnut tables are stunning and create a wow factor as soon as you lay your eyes on it. We use walnut for more than half the tables we assemble. The rich lines in the grain with the golden and amber accents make it look alive and vibrant. 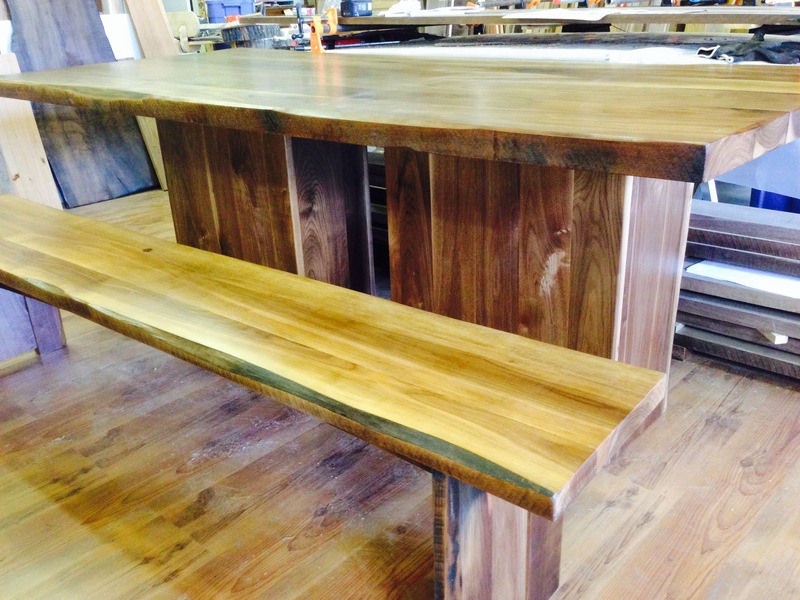 Walnut benches fit our table well and match the rustic look perfectly. Head and foot boards for beds give a sophisticated look with an elegant, rustic charm. The personality of the grain works with a large variety of linens and styles. 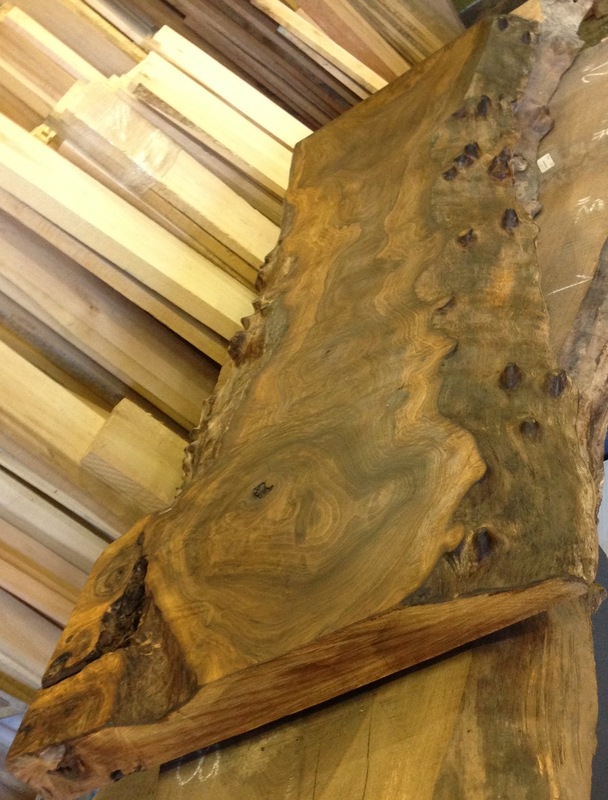 At Refined Rustic Furniture we work with all types of lumber and slabs from all over the world. When walnut is involved we already know, it will look better then expected every time. 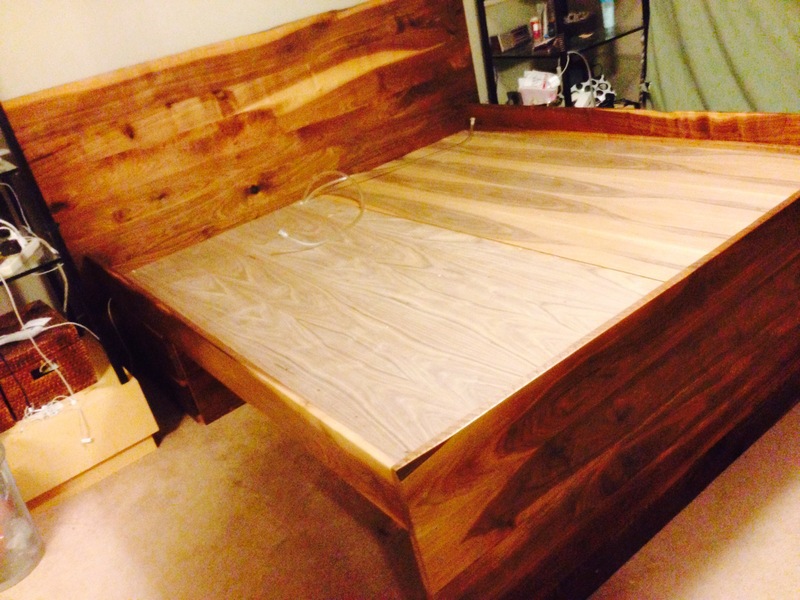 Whether DIY or a custom order walnut is our top pick. Come check us out!